Caroline, 41, had worked in investment banking for years and did not want for money, comfort, or prestige. Yet, despite her outward success, something wasn’t quite right; she was unhappy. On the fast track to becoming a senior managing partner, Caroline was extremely organized, productive, and efficient in her behind-the-scenes job crunching numbers, prepping deals, and crafting mergers. But something about the work had always felt hollow and mechanical; there was a social part of her personality that craved deeper, more sustainable relationships with clients and peers. Caroline’s unhappiness intensified over eighteen months and she finally decided to make a change. She stepped off the fast track and accepted a new position in training and development, a more visible role within the company. Leaving the comfort and safety of her behind-the-scenes role was scary, but she felt incomplete and knew she couldn’t stay where she was a moment longer. Jay had a dog-eared copy of my book Organizing from the Inside Out, spine broken, facedown on his coffee table, peeking out from under a mountain of clutter. He’d been studying the book for years, and loved everything it said, but was unable to sustain any order he created or to make any progress. The stifling state of his home kept him feeling isolated and lonely; unable to fully engage in life. He wasn’t able to invite friends or dates over, and his creativity was stalled. In finally finding his own place, Jay had hoped to put down roots and create a nurturing place of his own. But some old belief system was holding him back. “As I compromised with this problem and learned to live with it, it’s gotten worse and worse,” Jay said. Max, 60, was a devoted department head and beloved faculty member for more than thirty years, when the health care crisis forced him to consider an early retirement. One afternoon, the university suddenly announced that, for faculty fifty-five and over, the only way to save their health care coverage was to take an early retirement the following year. His first reaction was outrage. How could the employer he’d been so loyal to act with such callous indifference? Yet after the initial rage subsided, in quiet moments of reflection he could detect the tiniest impulse of excitement from deep within himself. His whole career he’d had the persistent feeling that there was something else he was meant to do. He hadn’t known what, nor had he ever taken the time to determine what that might be. He’d simply waited for a sign. He’d always maintained a love-hate relationship with the bureaucracy of education. Years had passed. Max felt that perhaps this forced retirement was the sign he needed. Everyone going through any sort of transition is encountering an opportunity to SHED. The impulse to leave the obsolete or broken or irrelevant behind in order to pursue something new is universal. If your current situation sounds similar to one of the above, or if you are going through any kind of career, relationship, or lifestyle change, it’s likely that you, too, are a candidate for SHED. SHED takes an activity usually approached like ripping off a Band-Aid and converts it into a positive, nurturing experience that you will savor. The objects or activities in your life (however stagnant or obsolete they may be today) served you at some point . . . or you wouldn’t have them in the first place. And they still have some meaning . . . or you wouldn’t be holding on to them. Studying the clutter and understanding its value to you before you toss it creates an opportunity for self-discovery, transformation, and a more meaningful and liberating change. And in this sense SHED is a uniquely personal process. So, do you need to get organized or to SHED? There are times we clearly need one or the other, but it’s altogether feasible that someone may require a bit of both. For example, when you are working through a major transition (new job, new relationship, new city, retirement, etc. ), you will benefit from SHEDing the stagnant areas in your home or office. At the same time, however, there might be a few areas (your briefcase, linen closet, kitchen cabinets) that don’t necessarily feel stagnant—they just need to be organized. Which do you need? 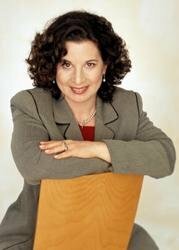 Log on to the free community at www.juliemorgenstern.com and take the online assessment called Do You Need to Organize or Do You Need to SHED? The shaded box below also summarizes the differences to help you figure out what you need. You organize to become more efficient. You SHED to get unstuck. Organizing involves designing systems for your space and time so you can function better where you are. 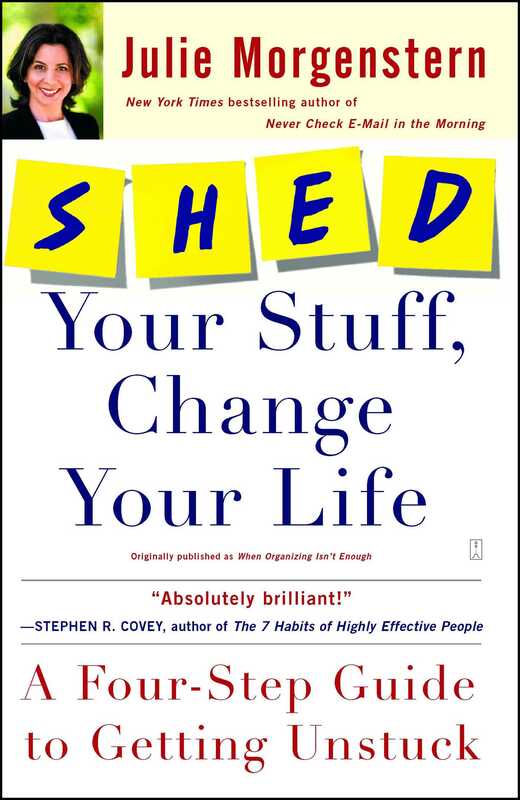 SHED involves eliminating the obsolete so you have room to grow. Organizing gives you access to what’s most important to you. SHEDing is a process for discovering what’s most important to you. Something that’s entirely organized but no longer relevant can be a candidate for SHEDing. For example, a perfectly organized closet filled with items you never use can be SHED. It’s possible to get organized without throwing anything away— purging is the one step you can skip. It’s impossible, however, to SHED without letting things go. While organizing has a clearly defined finish point (i.e., you can organize your garage or home office in a weekend), SHED is an ongoing process that generates movement and fuels transformation, which means the finish line is harder to define. You measure success by the feeling of being settled in a new place, as well as the subsequent energy, authenticity, and excitement about your life that ensue. Log on to the free juliemorgenstern.com community and get your personalized SHED profile. The diagnostic should take you approximately ten minutes to complete. The results will be a personalized SHED profile report, which is an analysis of your strengths and weaknesses in regard to each SHED step and a personalized guide to how to make the most of this book. Your personalized report will tell you exactly which parts of the SHED process will come easily to you and which ones will be more challenging. And it will provide advice on which chapters you should make sure to pay special attention to in order to ensure your success. When you SHED, it’s natural to stumble along the way, losing steam or speeding through steps you find particularly challenging. If you fast-forward steps or go out of order, you will shortchange the decluttering process and your transition won’t be nearly as transformative or fulfilling. For example, if you think of every object or activity as a “treasure” and can’t bring yourself to “heave,” you won’t free any space for growth. If you value nothing from the past and always jump straight to “heave,” you’ll end up leaving some wonderful gems behind and always feel empty. When you don’t “embrace your identity,” it’s easy to get caught up in someone else’s vision of who you are. And if you’re afraid to “drive yourself forward,” you’ll stagnate in the present, limiting your ability (and opportunity) to achieve the change you seek. SHED is a holistic process that works best when you give equal weight to each step along the path. Use your SHED profile to guide your reading, avoiding any of your own personal pitfalls and keeping yourself on track. Then I got divorced. I was 29 at the time and suddenly a single mom (my daughter Jessi was three). The late-night casting calls and marathon rehearsal weekends didn’t fit my new circumstances; and the nominal pay I received for the work I loved didn’t provide enough income to support myself, let alone raise my daughter. For the first six months after my divorce, I did a little bit of everything just to keep things together. I waitressed at a ’50s-themed diner (where my nametag read “Trixie”); I tried temping and read scripts. My rousing (if half-hearted) rendition of “Shout” (by the Isley Brothers) one February afternoon atop a sea of empty tables in my Trixie outfit only cemented my hunch that these were strange and uncertain times. When I was in graduate school, I’d always wished there was a “rent-a-mom” service available for frazzled people like myself—you know, someone to organize your closets and make sure you weren’t subsisting on a diet of Dr. Pepper and ramen noodles. The idea came back to me one night over a plate of lasagna with my old theater friend Walt (who, at the time, looked like he’d been living on a stage manager’s diet of cigarettes and Diet Coke himself). Walt agreed that a rent-a-mom service was a great business idea. He desperately needed the service himself and thought I should go for it. But I didn’t know the first thing about business, plus there was no way I could ever imagine trading in my peasant skirts for pinstripe suits, or my playbills for The Wall Street Journal. As the months rolled on, I realized I had to do something because clearly life as Trixie wasn’t the answer. So I called Ric, my old friend and mentor, to ask for his advice. I told him about my divorce and single motherhood, about Trixie and the failed temp assignments, and my rent-a-mom business idea. I confessed to being excited about the idea and told him that I might actually be able to pull it off—but I was afraid to pursue it for fear of what it said about me: that I was just another hapless theater dreamer that couldn’t cut it, a failure, a slouch. In his soothing, insightful way, Ric gave me permission to relinquish that identity. He said there was nothing wrong with wanting a more stable life for my family—it was a valid sacrifice and a wonderful gift to Jessi. He pointed out that he’d made a similar choice when he became an administrator so that he could support his family and provide a stable life. I felt an immediate sense of relief. With that burden of shame lifted from my shoulders, I barreled ahead. I was able to reconcile what I perceived as a noncreative profession with the idea that it would help me provide a better life for my daughter. I marched myself to SCORE (Counselors to America’s Small Business), bought books on working from home and picked friends’ brains for advice. I stopped thinking I knew nothing about business once I realized my lifelong experience as a consumer would guide me well. Pretty soon, my new rent-a-mom business, Task Masters, took off. About three years later, Task Masters was doing well, but I could feel the business beginning to plateau. I could only make as much as the hours I worked and couldn’t figure out how to expand. At the time, Jessi and I were still living in a small Brooklyn apartment. Like most New York City apartment dwellers, we didn’t have enough storage space, so I was storing about six boxes of my old theater production books underneath my dining room table. I’d meant to go through those boxes for years but hadn’t had the heart. I knew letting go of those books would mean I was permanently out of the theater and never going back. One lazy Sunday afternoon, realizing how ridiculously unattractive it was to eyeball those boxes every time we sat down for a meal, I finally mustered the courage to go through them. I heaved everything but the books from my two best productions. Within two months Task Masters soared to the next level. It was as if the chains holding the business back had been released. I hired people to work on my team, and we increased client billings and started to generate great publicity for the business. Suddenly there was no stopping me. As committed as I thought I had been to start the business, it’s now clear to me that I hadn’t had both feet in the saddle for the first few years. I hadn’t fully SHED my theater identity. Half of me was still tied to the theater world I’d chosen to leave several years before. By releasing those production books, I sent a mental and physical signal to myself that my business was now my core focus, and it took off. The feeling of mobilization was palpable. The fact that I held on to those production books for so long indicated that my original transition wasn’t complete, and that’s what I think makes my story universal. We’ve all felt lost struggling to make a change—afraid and hesitant to let go of the past. That transition was one of the most difficult of my life. But in order to move fully into the next phase of my life as a parent and provider, I had to SHED my old skin. Brooke, 53, divorced mother of two, public relations professional. Brooke was a reluctant empty nester. Once her children moved out, she grieved the end of her parenting years and was lost as to what the next chapter of her life would be about. Max, 60, married, retired theater professor. Max worked in academia for more than thirty years before being forced to consider an early retirement due to the health care crisis. Faced with an unexpected blank slate, he bravely began an adventure to reinvent himself. Caroline, 41, single, career investment banker. Caroline knew she looked powerful on paper, but in reality she felt hollow and mechanical. She was like a production machine, crunching numbers, cranking out reports, developing policies. Caroline craved human interaction, connections with others, and the opportunity to make a meaningful difference through her work. Shedding is defined by the National Geographic Association as “a natural process that must occur in order for growth to be achieved.” Birds molt, snakes slough, and lobsters shed their exoskeletons. Shedding is an ongoing process that mammals, arthropods, reptiles, and birds are engaged in most, if not all, of the time. In each case, the animal emerges from its shed fresh, lighter, and renewed. Transformation is as pervasive in our lives as it is in the animal kingdom, but the human shedding experience (at least the one we pay attention to) is more ethereal in nature. Yet by making it tangible, we put ourselves more in control. SHED is about experiencing a transition that transforms us in some way. And though this process is not always pleasant or easy, without it life gets stalled. Clinging to the old, the irrelevant and stagnant will bog you down, hold you back and make you feel stuck. It can confine you to a space that no longer fits, denying you the opportunity to be your truest best self. So let’s go quietly through your old attachments, releasing the stagnant and creating the space for transformation. I promise it will be a vibrant and fulfilling journey toward your destination. Take your time. Enjoy the ride.